Mad Dog Bail Bonds provides trusted bail bond services throughout all of California and the entire United States. As a reputable bail bond agent based in California, we have helped countless individuals obtain their freedom within 24 hour bail bonds services. We understand how important it is for you to get the fast and efficient services you need to get out of jail quickly. That is why we are dedicated to providing professional and reliable services for all of our clients. At Mad Dog Bail Bonds, we specialize in issuing both state and Federal bail bonds that can procure an individual's release from jail. In many cases, we are able to issue these bonds without collateral depending on the situation. Give us a call 24 hours a day and 7 days a week when you need the help of a bail bondsman you can rely on. Whether you, your friend, or your loved one is in need of a bail bondsman, you can expect the best customer service from an experienced and capable team. 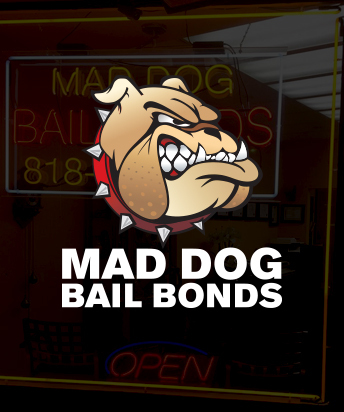 If you, or someone you love, are in trouble, contact Mad Dog Bail Bonds immediately. Across town, across state lines or across the country, Mad Dog Bail Bonds is the fastest way to get out of jail.